At least one-fourth of the nearly 700,000 military personnel who served in that war and its aftermath have complex but real health problems that the report now scientifically links to a poisonous stew to which they were exposed. 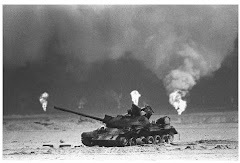 "Veterans of the 1990-1991 Gulf War had the distinction of serving their country in a military operation that was a tremendous success, achieved in short order. But many had the misfortune of developing lasting health consequences that were poorly understood and, for too long, denied or trivialized," the report said. The Congressionally-mandated report, titled "Research Advisory Committee on Gulf War Veterans' Illnesses" was handed over Monday to Secretary of Veterans Affairs James Peake at the department's headquarters in the nation's capital. The Boston University School of Public Health scientific staff assisted with research. Anthony Hardie, national secretary and legislative chair for Veterans of Modern Warfare Inc., a non-profit veterans group representing those who served during and since the 1991 Persian Gulf War, said the report is "huge." "It really closes one of the darker chapters of the legacy of the Gulf War, and that is Gulf War illness," Hardie said. "The report clearly lays out that Gulf War illness was caused by unique exposures; it lays out clearly that Gulf war illness is not a stress-related or trauma condition, that is is not the same as in wars before or since. It is unique," Hardie said by phone Monday. According to the report, "The extensive body of scientific research now available consistently indicates that Gulf War illness is real, that it is the result of neurotoxic exposures during Gulf War deployment, and that few veterans have recovered or substantially improved with time. "Scientific evidence leaves no question that Gulf War illness is a real condition with real causes and serious consequences for affected veterans. Research has also shown that his pattern of illness does not occur after every war and cannot be attributed to psychological stressors during the Gulf War," the report says. Gulf War veterans applaud the report, lamenting that it has been a long-time coming, noting the years in which fellow veterans suffered and died. Hardie said the report conjures "mixed feelings." On the one hand, "It is certainly a victory for Gulf War veterans. Gulf War veterans were right all along that their illnesses are related to unique exposures during the 1991 Gulf War. This is a government report based on science that clearly lays out the nature and scope and effects of Gulf War illness," he said. On the other hand, "it is bittersweet in that two decades after the war's end we still don't have treatments for Gulf War illness; they are sporadic," Hardie said. Some veterans illnesses remain unrecognized. The long ordeal over Gulf War illness for veterans of the 1991 war parallels the long fight of Vietnam veterans over post-war illnesses linked to Agent Orange, a chemical defoliant, many veterans say. The report notes those difficulties. "Some observers have suggested that these complexities pose too difficult a challenge, and that it is unlikely that the nature and causes of Gulf War illness can ever be known. On the contrary, the Committee has found that the extensive scientific research and other diverse sources of information related to the health of Gulf War veterans paint a cohesive picture that yields important answers to basic questions about both the nature and causes of Gulf War illness. These, in turn, provide direction for future research that is urgently needed to improve the health of Gulf War veterans," the report says. Many Gulf War veterans have voiced frustration that their problems were written off as stress-related. The report flatly says that "studies consistently indicate that Gulf War illness is not the result of combat or other stressors, and that Gulf War veterans have lower rates of posttraumatic stress disorder than veterans of other wars." A variety of factors were examined, ranging from sychological stress, vaccines, oil fires, depleted uranium. nerve agents, infectious disease and many more. Two immediately jumped out at Hardie, pesticides and pyrodstigmine. The latter, called simply "PB," was a pill taken by at least half of all troops in the 1991 war for purported protection against nerve gas. Troops in the current wars in Iraq and Afghanistan don't have to take the pills, Hardie noted. "That was one lesson we learned from the Gulf War. PB was not approved by the FDA, which gave a waiver to the Defense Department that waived the necessity for informed consent," Hardie said. "Widespread use of PB as a protective measure in the event of nerve gas exposure was unique to the 1990-1991 Gulf War. Pyridostigmine bromide is one of only two exposures consistently identified by Gulf War epidemiologic studies to be significantly associated with Gulf War illness. About half of Gulf War personnel are believed to have taken PB tablets during deployment, with greatest use among ground troops and those in forward locations. Several studies have identified dose-response effects, indicating that veterans who took PB for longer periods of time have higher illness rates than veterans who took less PB. In addition, clinical studies have identified significant associations between PB use during the Gulf War and neurocognitive and neuroendocrine alterations identified many years after the war. Taken together, these diverse types and sources of evidence provide a consistent and persuasive case that use of PB during the Gulf War is causally associated with Gulf War illness." 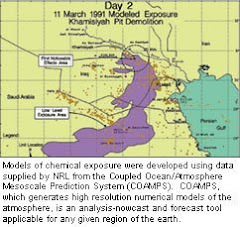 Depleted uranium, meanwhile, a much-considered potential source of illness over the years, was not likely a culprit in Gulf War illness, although the report leaves open a door by noting that DU very likely has effects of its own. "Exposure to depleted uranium munitions is not likely a primary cause of Gulf War illness. Questions remain about long-term health effects of higher dose exposures to DU, however, particularly in relation to other health outcomes," the report said. Committee members said the report offers a "blueprint" for the incoming Obama Administration to focus on Gulf War veterans. It also could help those from other countries, including troops allied with the U.S. during Desert Storm, who have reported similar health problems. "A renewed federal research commitment is needed," the committee report says, "to achieve the critical objectives of improving the health of Gulf War veterans and preventing similar problems in future deployments. This is a national obligation, made especially urgent by the many years that Gulf War veterans have waited for answers and assistance." Posted by Mike Barber at November 17, 2008 3:53 p.m.